An interesting Martin Rushent production here…Both tracks are instrumentals, with Rub Out sounding like a Glammed up Prog Dancer stealing its "tune" from John Carpenter’s Assault On Precinct13. This is pretty likely as that movie was very popular as midnight showings at the time. 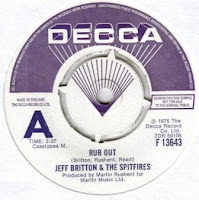 The flanged drums and repetitive motif should prove popular for those into sampling…Breakwood is slightly more funky, but is swamped in Hammond with a cool tribal "Let There Be Drums" break…Is Jeff Britton in fact Geoff Britton who drummed with The Wild Angels and went to play with Wings? Lyrically Drugtaker is pretty ineffective as an anti-drug song, however the track is a sumptuous Spectorian Psych/Pop number with an arrangement swamped in echo and incredibly loud timbales that recall Pet Sounds’ Waiting For The Day. 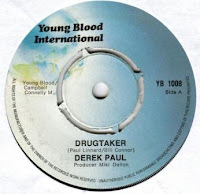 Although it came out in ’72, the sound is pure ‘68, so it could well have been a master that was hanging for a few years that Miki Dallon simply resurrected (as with Kidrock’s Ice Cream Man) for his revamped Young Blood label. 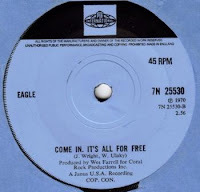 Tucked away on the flip side of a pretty good Northern Stomper, Come In It’s All For Free is a cracking late Garage Rocker. It’s quite a straightforward chuggin’ affair until the lead break comes along where it goes all twangy over an underlying semi-Buddy Holly beat. The track gets a bit diffused after that, but the tune rides out fine until its conclusion. 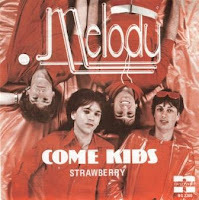 A blog reader sent me this track and no one I know knows who it is. It's probably '67/'68 and would fit perfectly between Procol Harum and Rupert's People. There are some suggestions that it may be French or Dutch, but it sounds pretty UK-ish to me. Please click on title for a full version of "Unknown Track"
Slipstream is a tasty Punked-out Stonesian affair with more than a nod to the New York Dolls. The track is as tight as can be and powers straight down the mainline. It features female backing vocals that really lift the chorus and yelps on the finale that are pure Johansen. Produced by the legend that is Boudewijn de Groot, Slipstream was recorded in 1974 under the name Stud. 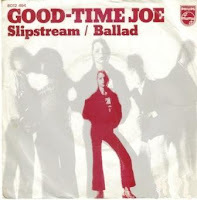 The record probably never came out then, but Philips decided to release it a year later as by Good-Time Joe. Stud/ Good-Time Joe featured Dutch Rock Junkie and piano-player Herman Brood in its line-up.